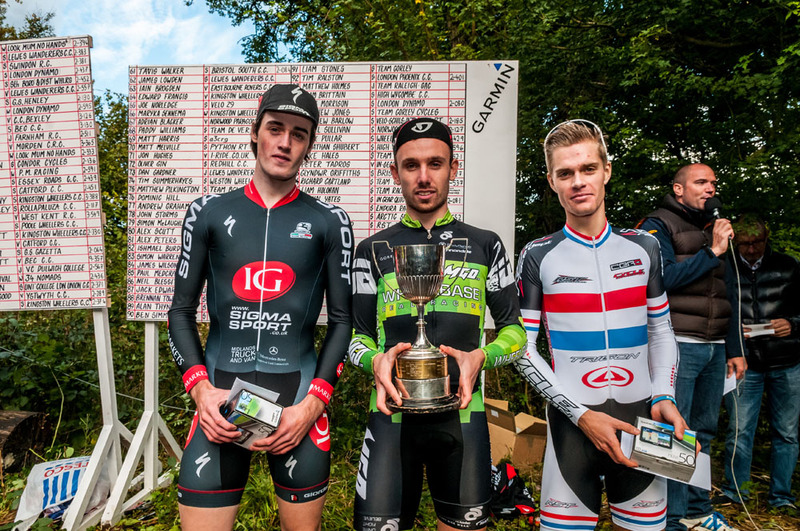 After securing a shock victory in the Monsal hill-climb the previous week, Jack Pullar proved it was no fluke – and threw down the gauntlet for the 2012 National Championships – when he won the Bec CC hill-climb with a course record time on Sunday. The 22-year-old Wheelbase rider from Lancashire clocked 1-42.9 to narrowly beat Dan Fleeman’s five-year-old record by just 0.1 seconds – but his ride was all the more impressive because of the headwind which made the 700-yard climb of White Lane, Titsey, all the harder. Pullar was almost three seconds quicker than defending national champion Gunnar Gronlund (RST-Trigon) in second place, while IG-Sigma Sport’s Jake Hales was third, another six seconds back. For his efforts, Pullar won £100 for breaking the record, but will receive a £2,000 60-inch flatscreen TV courtesy of Sharp, one of a growing list of sponsors which included Garmin UK who had added around £1,000 to the prize fund of more than £5,000, making the event one of the richest in the country. 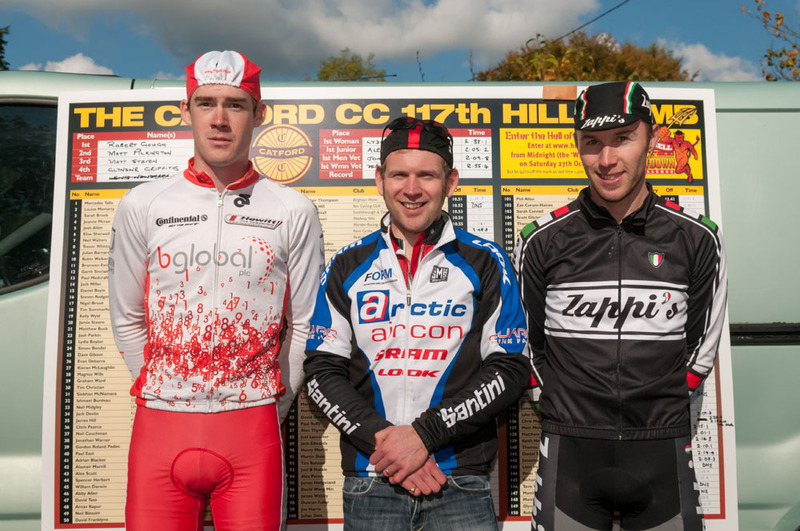 Earlier in the day, the Catford CC had staged their hill-climb at Yorks Hill, where Rob Gough (Arctic SRAM) took victory by four seconds with 1-54.8sec for the 600-yard climb, holding off Team Bglobal’s Matt Pilkington for the win at Goathurst Common. Further north, former national champion Matt Clinton (Mike Vaughan Cycles) enjoyed a double victory on Saturday when he rode the Holme Valley Wheelers climb in the morning and the Huddersfield Star Wheelers event in the afternoon. He won the Huddersfield event on Jackson Bridge by an impressive 17 seconds from Sam Ward (Otley CC), with Saddleworth Clarion’s Ben Gillespie took third, another seven seconds off the pace. And in the afternoon he pipped Josh Teesdale (EFC Omega Pharma) by 22 seconds, with Ward settling for third. And Clinton then added to his weekend tally by taking victory in the Lyme RC event on Mow Cop, smashing the course record by 11.2 seconds on his way to victory while riding a 42-21 fixed wheel. He clocked 4-24.8 to win by around 15 seconds from Buxton CC’s Lee Baldwin, and break Jim Henderson’s long-standing course record. Charles Taylor (South Pennine RC) took third, another nine seconds off the pace. Meanwhile, in time trialling the composite pairing of Adam French (Rapha Condor CC) and Rhys Howells (East London Velo) were fastest victory in the Hainault RC two-up 25 at Ugley, Essex, on Sunday. The pair clocked 54-20, 19 seconds better than East London Velo duo Roger Maidment and Rob Chaplin.